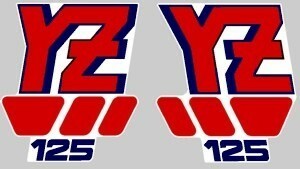 1988 Yamaha YZ 125 Radiator Shroud Decals. OEM replica. 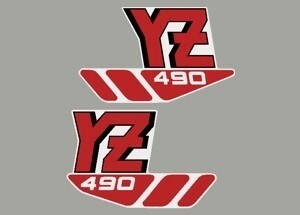 1988 Yamaha YZ 490 Tank Decals. OEM replica. Universal Renthal / DID Swingarm Decals. 3 styles to choose from. Click on the title to select a year. Manufactured by EVO MX in the UK using the finest material that money can buy. Built to last on your vintage MX bike. All tank decals are perforated for easy installation and long lasting performance. All other decals are not perforated. Universal vintage mx rear fender trim kit. Outlined in white. 1 trim kit only. Picture is for display. Universal vintage mx rear fender trim kit #2. Outlined in white. 1 trim kit only. Picture is for display. Universal vintage mx rear fender trim kit #3. Outlined in white. 1 trim kit only. Picture is for display. Universal vintage mx rear fender trim kit #4. Outlined in white. 1 trim kit only. Picture is for display. Universal vintage mx rear fender trim kit #5. Outlined in white. 1 trim kit only. Picture is for display. Universal vintage mx rear fender trim kit #6. Outlined in white. 1 trim kit only. Picture is for display.